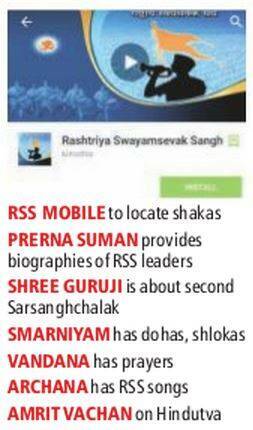 One of the applications is ‘RSS mobile’ with which one can locate the nearest Shakha. The move came after the Sangh realised the power and reach of the social media, which was evident by the role it played in BJP’s massive win in last year’s Lok Sabha elections. Locating a Rashtriya Swayamsevak Sangh (RSS) shakha or information about its ideologues and ideology is now just a click or a touch away on your smartphone. The RSS has launched seven mobile phone applications with aim to widen its youth base by spreading its “nationalist thoughts”. The move, a senior RSS functionary said, came after the Sangh realised the power and reach of the social media, which was evident by the role it played in BJP’s massive win in last year’s Lok Sabha elections. The applications are now available on the android phones. One of the applications is ‘RSS mobile’ with which one can locate the nearest Shakha. So far, locations of shakhas being organised in three cities including Bangalore, Hyderabad (RSS calls it Bhagyanagar) and New Delhi, can be found through this application. The application also hosts a number of other features such as a panchang as per Hindu calender, Sangh Samachar (news reports of RSS), books on RSS, wall papers and Sangh parivar’s songs among others. Quotable quotes by thinkers and leaders such as Prime Minister Narendra Modi, former President A P J Abdul Kalam, philosopher Chanakya among others and profiles of all former Sarsanghchalaks and present RSS chief Mohan Bhagwat is also available. ‘Prerna Suman’, another application, provides the biography of RSS founder K B Hedgewar, RSS ideologue Madan Mohan Malaviya, socialist Ram Manohar Lohia and first prime minister Jawahar Lal Nehru. Another mobile application is dedicated to second Sarsanghchalak, Shree Guruji, who had drafted the structure of RSS and its affiliate organisations such as VHP and Jan Sangh. The ‘Smarniyam’ application has 735 quotes, dohas (couplets) and shlokas (incantations) in Sanskrit. An application, ‘Vandana’, has prayer, both in text and audio form, which is recited during RSS events. ‘Archana’ is a similar application that has collection of RSS’s songs in different languages. The seventh application, ‘Amrit Vachan’, too, has quotes on 17 different issues including social harmony, religion, Hindu, Hindutva and others. “New generation youths are using and are dependent on social media and information technology in daily life. RSS connects with every section of society and can not avoid tech-savvy youths who are going to take up the nation’s responsibility in future. They should know nationalist ideology of RSS,” an office bearer said.